There happens to be one or two interesting car manufacturers in Germany ( and Europe). You can even get a tour in some of them. You can set up a factory tour by contacting Porsche Cars North America in Altanta, GA. Their general number is (770) 290-3500. To set it up, you should let them know how many people are coming, your names, potential dates for the visit, and a contact phone number and/or fax. This has to be done typically well in advance, as they can accommodate only so many people. Plan early. 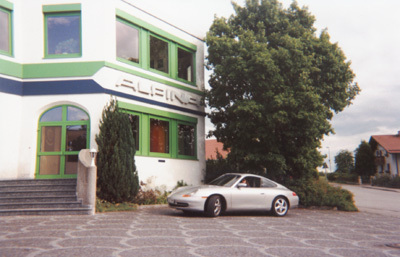 Alpina is a car manufacturer located in Buchloe, Bavaria. If you are not familiar with Alpina, they take BMWs and make them special with different engines and body style treatments. These cars are technically no longer BMWs. Buchloe is about 65 due west of Munich. To get there, take A96 west towards Landsberg. Buchloe is about 10 km past Landsberg. Take the Buchloe exit (#23) from the autobahn and head in the direction of town. There will be a map on the right as you approach Buchloe. It’s probably a good idea to get your reference from there. Alpina is in the southeast part of town (H7 on the map), on the corner of Alpenstraße and Münchener Straße. Stay on the main road towards town. Right before this road bends into a tee, you’ll pass Alpenstraße to your left (a little after the gas station). Turn left and go down about 1 km. Alpina will be on your left. First of all, it’s pronounced “roof” (please - no “the Ruf is on fire” jokes). Technically, Ruf is a car manufacturer, not just a tuner. However, Ruf can modify your car, too. Ruf is located in Pfaffenhausen (actually very near Buchloe). From the north, you can get there by getting on the A8 and taking the Günzburg exit. Head south on the B16 about 43 km (28 mi). Stay on B16 as it winds its way down. Once in Pfaffenhausen, Ruf is located at the southeast end of town. There is a DEA gas station on the left (north) side of the road. His showroom is right next to the gas station (that may be changing, as it is under constrution when I was there). I attended the Open House hosted by the German Region of PCA (Porsche Club of America). Alois Ruf gave us a personal tour of his facilities. In addition to manufacturing “new” cars such as the Ruf CTR2, Ruf also modifies Porsches (for performance) as well as doing restorations. 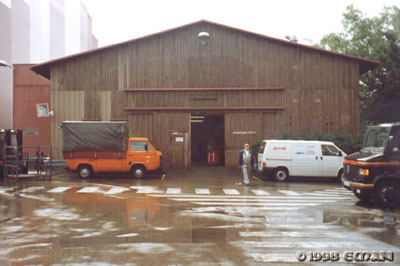 Each car in his shop held a story. The picture on the right (Estonia & Alois Ruf) was taken during the Open House.